A View From A Distant Shore. It was a collection of short stories from Eastern Europe I believe. It was an older secondhand paperback. I mostly remember a single story from the anthology. It was about the light just going out of the world. Matches eventually gave less and less light until finally no light at all. I don't remember the names of any of the authors, the 90s were apparently a tumultuous time for me. I can't find even a reference to it online. 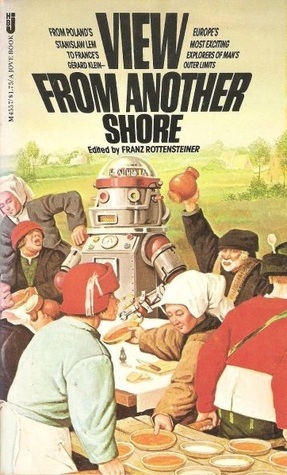 Franz Rottensteiner's View From Another Shore contains a story entitled "A Modest Genius" by Vadim Shefner , which does cause the whole world to grow dark. It is a collection of short stories which was published in 1973, which matches your timeframe. Sergei Kladesev was born on Vasilyevski Island, Leningrad. He was a strange boy. While other children were making sand pies and building castles, he was drawing sections of odd-looking machines on the sand. In the second grade he built a portable machine, powered by a pocket flashlight battery, which told each pupil how many good marks he would receive during the coming week. Grown-ups considered the machine uneducational and took it away from him. I found that title by searching ISFDB titles for "view from a", and then grabbing the one that had "Shore" in it. Organic Marble provided that one of the stories had a light-dimming mechanism. Liussa went to the window and looked out. "Sergei, what's going on?" she asked in astonishment. "It looks as though an eclipse is beginning. The whole island is in dusk and it's getting dark in the distance too." "It's now dark over the whole earth and even on Mars and Venus. The machine uses a great deal of energy." Not the answer you're looking for? Browse other questions tagged story-identification short-stories anthology-book or ask your own question.